Many books cover functional testing techniques, but relatively few also cover technical testing. 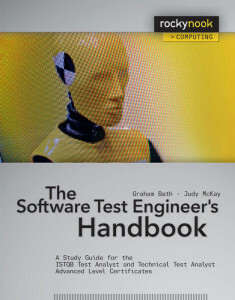 The Software Test Engineer’s Handbook, 2nd Edition fills that gap. Authors Graham Bath and Judy McKay are core members of the ISTQB Working Party that created the new “Advanced Level Syllabus—Test Analyst” and “Advanced Level Syllabus—Technical Test Analyst,” which were released in 2012. This book presents functional and technical aspects of testing as a coherent whole, which benefits test analysts/engineers and test managers. It provides a solid preparation base for the “Advanced Test Analyst” and “Advanced Technical Test Analyst” exams, with enough real-world examples to keep readers intellectually invested. The information presented in this book will help the reader become a highly skilled Advanced Test Analyst and Advanced Technical Test Analyst. Readers will be able to apply this information in the real world of tight schedules, restricted resources, and projects that do not proceed as planned. Graham Bath’s experience in testing spans over 25 years and has covered a wide array of domains and technologies. As a test manager, he has been responsible for the testing of mission-critical systems in spaceflight, telecommunications, and police incident-control. Graham has designed tests to the highest levels of rigor within real-time aerospace systems such as the Tornado and Eurofighter military aircraft. As a principal consultant for the T-Systems Test Factory, he has mastered the Quality Improvement Programs of several major companies, primarily in the financial and government sectors. In his current position, Graham is responsible for the company’s training program and for introducing innovative testing solutions to Test Factory’s large staff of testing professionals. Graham is co-author of the 2012 ISTQB Advanced Level Certified Tester syllabi. He is a longstanding member of the German Testing Board and chairman of their Working Party on the advanced syllabus. Judy McKay has spent the last 20 years working in the high tech industry with particular focus on software quality assurance. She has managed departments encompassing all aspects of the software life cycle, including requirements design and analysis, software development, database design, software quality assurance, software testing, technical support, professional services, configuration management, technical publications, and software licensing. Her career has spanned across commercial software companies, aerospace, foreign-owned R&D, networking, and various Internet companies. Judy also teaches and provides consulting services. Her courses cover the spectrum of software quality assurance, including creating and maintaining a world class quality assurance team, designing and implementing quality assurance and effective testing, and creating and implementing useful test documentation and metrics. Judy is co-author of the 2012 ISTQB Advanced Level Certified Tester syllabi and is the president of the American Test Board (2012–2016) and a member of the Technical Advisory Board. She has authored Managing the Test People, a book filled with advice and anecdotes for both new and experienced software test managers and leads. Rocky Nook is a leading publisher of books written by photographers for photographers. Rocky Nook boasts a broad collection of top-selling titles by renowned photographers from around the world, covering a variety of photography topics including composition, fine art, cutting-edge technology, and instruction manuals. Rocky Nook titles deliver premier content that helps beginning through professional photographers master the art, craft, and technology of photography. Founded in 2006 and headquartered in Santa Barbara, California, Rocky Nook is closely associated with dpunkt.verlag, a German publisher of computer and digital photography books.